Add minced meat to a bowl and season with salt. Knead to combine and refrigerate for approx. 1 – 2 hrs. Pre-heat oven to 180°C/355°F. Peel and halve onions crosswise, then remove the inner cores to allow room for the meat. Use your hands to form walnut-sized balls out of the minced meat. Add each meatball to a halved onion and transfer them to a baking dish. Bake for approx. 35 min. or until browned. Grate cucumbers and ginger, then add to a sieve and press out as much liquid as possible over a bowl. Toss liquids and transfer cucumbers and ginger to a clean bowl. Add yogurt, ground cumin, and season with salt and pepper to taste. Stir to combine. 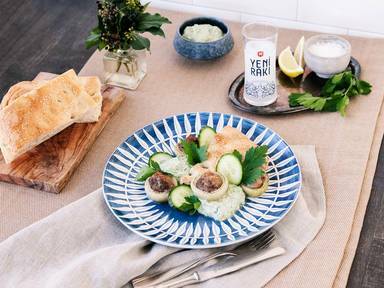 Serve meatballs with Turkish bread, cucumber yogurt dip, fresh cucumber slices, and parsley. Enjoy!